It more or less looks like an ordinary vacuum tube, but if you look closer inside the glass, you can see a bunch of overlapping numbers(0 to 9). This kind of lamp was used a lot during the 60's. This lamp comes from a big calculator(bigger than a typical modern computer) that I disassembled when I was 10 years old. This tube is 1" high, is model no. CD78 and is made in Japan. Nixie tubes like this exists in many sizes, even 6" tall. 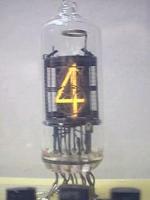 I would like to have 6 identical tubes like this one, to build a clock. In my opinion, a nixie display is way nicer than a LCD or LED display. Again pictures taken in the dark, but less exposed. Approximately ten years after obtaining this tube, I finally learned how to make it work. I had already tried a few times without success. The reason is that this tube needs approximately 130 volt to light up. I never thought a voltage this high was required. They are very easy to control. The positive voltage goes on the pin connected to the grid. 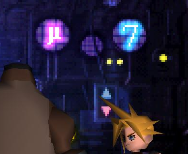 Next, you just need to tie the negative wire to one of the digit pins to make the corresponding number illuminate. Here is the schematic: nixie_counter_shema.gif. NOTE: The transistors are MPSA42. Of course, in all cases, the color is off. So it could also be neon tubes. But hey, in the end, it's just a game. 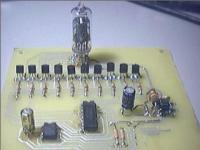 Also, if you search for 'nixie clock' on Google, you will see a lots of beautiful projects.